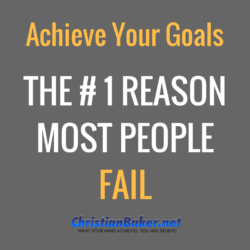 Would you like to know the number 1 reason why most people never achieve their goals? Stay tuned and as I share how you can achieve the goals and the life that you want! In a previous post 3 Steps To Achieve Anything In Life I talked about the lack of clarity and resistance being a key factor as to why so many never achieve their goals. But if you have got clarity and know what you want and why you want, often this is still not enough. Even when you have all the best intentions, and goals in place, the missing secret, the missing piece of the puzzle, is ACTION, or more precisely, regular consistent action. Everything we do is a result of the action or the inaction we take. You need to create a plan, prepare yourself, put it into practice and execute your plan. Compare this to going on holiday, you have to decide where you don’t want to go, make a decision on where you do want to go. Then you have to plan how you’re going to get there, pack and prepare for it, and then you actually have to go. If you did all this in your own head, without taking action to book the holiday and leave your home, take the transport to get you there, then nothing with actually happen. You need to choose what you want, commit to doing it and then take the action towards it. But remember everything you do is either going to move you closer to what you want or further away from it, but it’s your choice! So your action for today is to review and reflect on what you want, why you want it and then create and design a plan that you can execute to help move towards it. Allow yourself to think differently, your thoughts lead to your feelings, feelings lead to actions, change your thinking and everything else follow. Take the right actions and make it happen. If this video has help or encouraged you in anyway please, like share, click subscribe to get all future videos. Remember what your mind believes you will achieve – believe in yourself, take action and achieve the life you want!